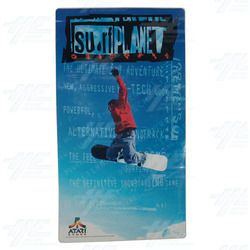 This Surf Planet Side Cabinet Sticker is designed for that title arcade machine. It will be useful to customers looking to replace old or damaged stickers; customers looking to upgrade a cabinet or recondition a machine; or, customers looking to update the look of their location or gaming area. Surf Planet is a first-person 3-D snowboarding game from Gaelco.